The following items are typical of the types of equipment used for grilling food. Although some of the grilling accessories are not required for successful grilling, several tools are necessary to achieve satisfactory results and to ensure that grilling is performed efficiently and safely. Grilling mitts and pot holders, which protect hands and arms from hot surfaces, are a necessity when grilling food. Grilling temperatures often exceed the standard roasting temperature in a conventional oven so it is vital that skin is adequately protected. Standard oven mitts may be used when grilling, but mitts designed specifically for grilling are best because they are longer and protect the lower part of the arm as well as the hand. Silicone gloves and welding gloves (shown) are popular choices and feature high heat resistance. 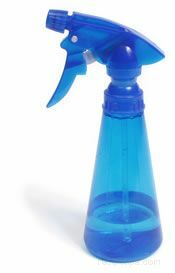 A water spray bottle is useful for extinguishing flare-ups (caused by melting fat dripping from food onto hot coals) that may get out of hand. A water spray bottle should be used only when grilling food on a charcoal grill. 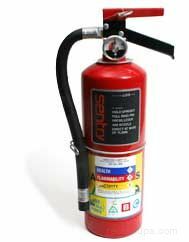 A fire extinguisher should be handy when doing any type of grilling (indoor or outdoor) in the event that a mishap occurs. When grilling outdoors, it is also a good idea to be near a water source such as a garden hose connected to an outdoor water faucet. An often used device for this type of grilling is a ring constructed of metal or heavy masonry that is used to contain a small fire, which is usually fueled with wood or charcoal. Commercially produced metal pots and kettles, designed specifically for wood burning, are also used. Outdoor grills that are designed for use with charcoal are available in a wide range of styles and sizes. Some charcoal grills are very basic, consisting of a small cast iron container with a grate placed on top. Other types of charcoal grills may be elaborately constructed and come with a variety of features. 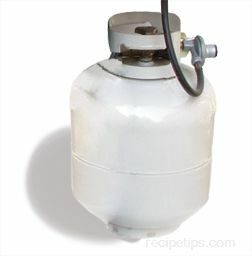 Grills fueled by propane gas are an extremely popular variety of outdoor grill. Like charcoal grills, they are available in a wide variety of styles, sizes, and price ranges. The convenience that gas grills provide is perhaps the primary reason for their popularity. There are several types of grates that are manufactured specifically for indoor fireplace grilling. One of the most popular is the Tuscan grill, which features a heavy metal grate and sturdy legs that allow the grill to be placed over the wood or charcoal in the fireplace. Many of the manufacturers of gas kitchen ranges offer models that include a built-in grill or feature a built-in grill as an option. Like indoor electric countertop grills, built-in grills are convenient to use and are a good substitute when grilling cannot be performed outdoors. 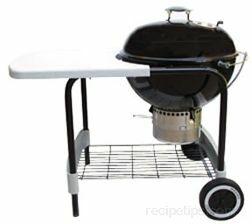 Portable electric countertop grills are the most popular type of indoor grill. They are designed to provide a grilled or broiled flavor to a variety of foods, although perhaps not as pronounced a flavor as an outdoor grill provides. 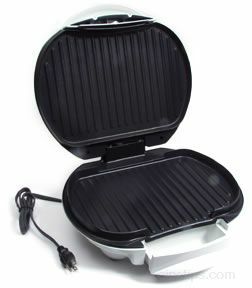 Portable indoor electric grills are convenient to use and are easy to clean. Most models are inexpensively priced. Outdoor grilling is primarily done on grills designed to burn charcoal or on grills that are fueled by propane gas. 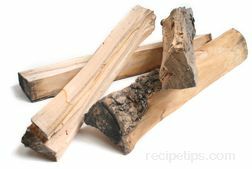 Firewood and kindling is the traditional fuel source for grilling on a grate over an open fire. Although an open fire may be less convenient to use as a heat source for grilling, it is still preferred by many people, especially when camping and hiking or grilling indoors over a fireplace. There are a number of materials used for igniting the fuel required for grilling and a wide range of devices are available to help make the process easier and more efficient . Although most gas grills come with an automatic ignition and do not require any other aids for lighting the burners, many of the other types of equipment used for grilling require auxiliary methods for ignition. It is essential that proper safety procedures be followed when igniting fuel for grill fires. 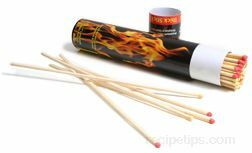 Long wooden matches are a handy item for lighting charcoal or kindling for wood fires. They are much easier to handle than matches in a match folder and once lit, they can be held in place for an extended period until the fuel begins to flame. Like long wooden matches, long handle butane lighters keep hands safely away from direct contact when starting a grill fire. They are inexpensive and have a reasonably long life. A number of manufacturers offer combustible fluids, which are often produced as a blend of flammable liquids that can be used as an aid to light a fire for grilling. Lighter fluid is most often used in conjunction with charcoal fires. Extreme care when using lighter fluid is a must to ensure safety. 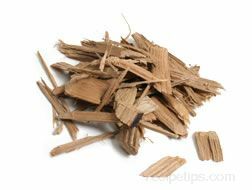 Small, easy to light wood chips and pieces of kindling have long been a favorite way to make fire starting trouble-free. Most fire starters are made with a blend of compressed sawdust and wax that burns easily. 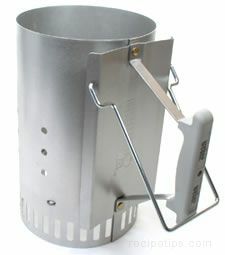 They are a popular option as an aid when lighting charcoal or firewood. An electric starter is a device that is useful for igniting charcoal. The looped heating element is placed into the center of a charcoal pile and the heavy duty cord of the starter is plugged into an electric outlet. The coals should be well lit within 10 to 15 minutes. The starter is then unplugged, removed from the charcoal, and placed out of the way on a noncombustible surface until it has cooled. A chimney starter is a large, hollow, upright cylinder used as an aid to ignite charcoal evenly. The cylinder is separated into two spaces by a wire partition. Crumpled newspaper is placed below the wire partition, while charcoal is placed on the top. The paper on the bottom is lit and in 15 to 30 minutes, the charcoal is glowing orange-red. Basting tools are useful implements for applying sauces, marinades, oil, or melted butter to food as it is being grilled. Basting sets that include a pot and brush are available in a variety of styles and sizes. The most popular models include a stainless steel pot that holds two cups or less. The pot usually has measuring marks indicated on the inside or outside of the pot and it often has a pour spout. Some basting pots include a cover. 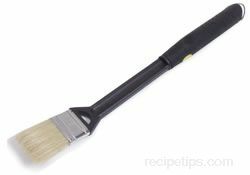 The basting brush is usually made with bristles that are formed into a flat or round shape. The bristles are often made of silicone or nylon, which are effective materials for basting food and yet they can be easily cleaned. The bristles do not retain the flavors of the basting sauce after cleaning, which is beneficial when using the basting brush again for a different grilled food basted with a different mixture. 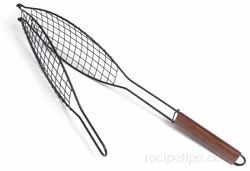 Long handle basting brushes are designed specifically to keep hands and arms away from the heat of the grill when applying marinades and barbecue sauce to foods. 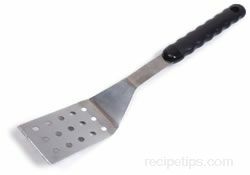 Brushes with shorter handles can be used to apply cooking oil to foods and/or to the grill grate prior to preheating the grill. A flavor injector is a syringe type of apparatus that is used to infuse food with any flavored liquid inserted into the syringe. Wine, lemon juice, butter, and flavored oils are only a few of the liquids that can be injected into food using the syringe. Wood is used not only as a fuel, but also as a means to add flavor to grilled foods. As the wood burns, it produces smoke that infuses its unique flavor into the food being grilled. There are many types of wood that are used for adding flavor to food. Hickory, mesquite, apple, maple, and oak are among the many popular varieties. 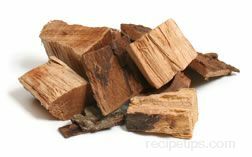 Wood used for adding flavor to grilled food is available in the form of chips, chunks, chiminea, logs, and planks. When using commercial brands of grilling woods, the directions on the packaged should be followed for proper use. 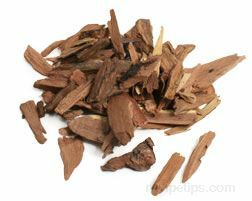 Wood chips must be soaked for a minimum of 30 minutes before they are added to a gas grill or a charcoal grill. When using a gas grill, the soaked wood chips can be placed in an aluminum pouch (with 4 to 5 holes poked through) or into a smoker box. 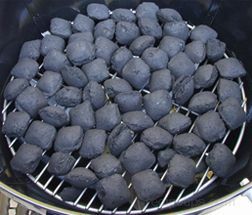 When using a charcoal grill, the soaked wood chips can be placed directly on the hot coals. Tongs and Spatulas are preferred over forks when turning meat on the grill because they do not pierce the meat, allowing juices to escape. 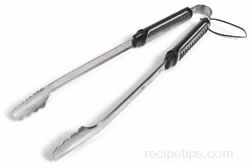 Tongs and spatulas with long handles are useful when grilling because hands and arms are kept at a safer distance from the heat than they would be when using standard length kitchen implements. A barbecue hook is used to turn food on the grill. When grilling meat, it hooks into the meat securely, preventing the meat from slipping while turning. A barbecue hook pierces the meat, which may allow some of the juices to escape, but not to the extent caused by the use of a fork. Skewers are used when grilling to hold small pieces of food. They are available in metal and bamboo varieties. When using bamboo skewers, it is necessary to soak the skewers for 30 minutes before placing them on the grill. Soaking ensures that the skewers will not burn. A skewer holder is used to keep several skewers raised above the grilling grate at one time, preventing food from burning. Cookware designed specifically for grilling is available in a number of forms and styles. Most have an open grid design that allows heat and smoke to enter the pan, infusing the food with flavor. Grilling cookware is useful for holding small pieces of food, preventing the food from falling through the grate of the grill unit. Of course, almost any standard piece of kitchen cookware can be used on the grill, but the food will lack that unique grilled flavor. The food will be cooked similar to food cooked on a kitchen range. Cast iron griddles are also quite popular for cooking a number of foods that would be difficult or impossible to cook directly on the grilling grate or in a piece of grill cookware. Foods such as eggs or pancakes are easily cooked on a grilling unit when using a griddle. 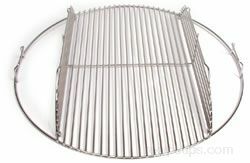 A grill screen or grid is used on the grill to prevent small foods from falling onto the coals beneath the grill grate. The grill screen/grid is placed directly onto the grill grate and is preheated prior to cooking foods on it. A flat grill screen usually has an edge that contains a backstop to prevent foods from sliding off the grid when the food is turned during the grilling process. 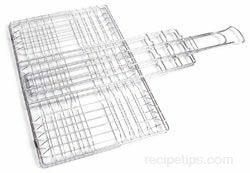 A basket style grill grid is a concave shaped grid that holds the food slightly above the grill grate. Grill screen/grids are often constructed of a nonstick material and are available in a range of sizes to accommodate most grills. A roasting rack is useful for keeping large cuts of meat from making direct contact with the grilling grate. The rack allows for easy rotation of the meat during the grilling process. Removal of the meat from the grill unit is less cumbersome because the rack is simply lifted from the grill with grilling gloves. Clean up is quick and easy. This handy grilling rack is designed to cook poultry in a vertical position. The rack is inserted into the cavity of a chicken, turkey, or game hen, which allows the bird to be cooked vertically on the grill. Rotation of the rack during the grilling process is not necessary to ensure good results, but the lid of the grill should remain closed in order to surround the meat with even heat, ensuring proper doneness. A chick can rack is grilling implement used for cooking chicken in a vertical position. The rack is designed to hold a canned beverage, such as beer; hence the name of the popular recipe, beer can chicken. The rack, holding the open can of beer, is slid into the cavity of the chicken and it is then placed onto the grill. As with a vertical poultry cooker, the lid of the grill should remain closed in order to surround the meat with even heat. As the beer heats up, it permeates the chicken with flavor and moisture. A chick can grill is also referred to as a beer can grill rack, a chick-can grill rack, or simply a can grill rack. A wire grill basket is essential when grilling small pieces of food that may fall through the grate or may not stay on skewers securely. The grill basket is convenient for allow food to be flipped easily on the grill. Wire grill baskets are used for small pieces of fish, meat, fruit, and vegetables. Some baskets have long handles, which allow them to be turned on a grill or open fire without hands and arms coming in contact with the heat source. A kabob basket is an excellent alternative to meat skewers for grilling small pieces of food. It is an especially useful tool for grilling items that are too delicate to attach securely to a skewer. Stainless steel is most often used to construct the kabob basket into a long, rectangular, cage-like shape. Some kabob baskets include a long handle, which allows the basket to be turned easily during the grilling process and also allows for easy removal of the basket from the grill when the cooking is complete. 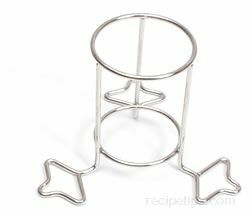 A fish basket is constructed in the shape of a fish and specially designed to hold fish securely during the grilling process. It prevents the flesh of certain types of fish from falling apart, which can happen when cooking delicate varieties of fish directly on the grill grate. Most fish baskets include a long handle, which allows the basket to be turned easily during grilling and also allows for easy removal from the grill when the cooking is complete. A rotisserie basket can be used for rotisserie grilling flat pieces of food. 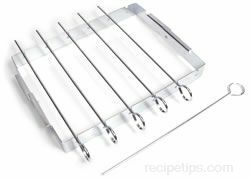 This allows food to be cooked on the rotisserie without having to be directly skewered, which can be rather cumbersome procedure when cooking flat pieces of food. The basket attaches to the rotisserie motor and cooks the food in the same manner as larger foods attached directly to the spit of the rotisserie. Constructed of stainless steel, the rotisserie basket holds foods securely during rotisserie grilling. It can be used to cook foods such as flat beef or pork cuts, ribs, poultry pieces, and fish. 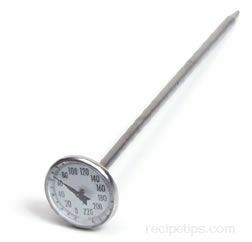 The most reliable method for determining proper doneness of grilled food is with an accurate thermometer. 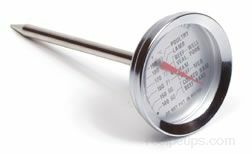 It is especially important to use a thermometer when grilling foods such as pork, poultry, or ground meat. Instant read thermometers are the best type to use when grilling. Some models cannot be left in the food during the cooking process and should be used to check the internal temperature of the food when the estimated cooking time has elapsed. 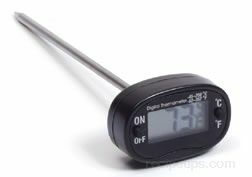 Other models, such as a digital instant read thermometer with a heatproof sensor and wire, can be left in the food for the entire grilling time because only the sensor remains in the food: the heatproof wire permits the actual digital workings of the thermometer to be away from the heat of the grill. 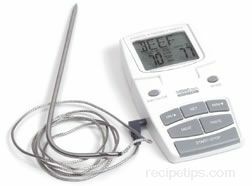 Instant read thermometers with an extended tip, as well as fork style thermometers, are designed specifically for grilling to protect the chef from the heat of the grill unit. 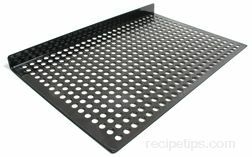 When using a charcoal grill for indirect grilling, especially when grilling foods that require a lengthy cooking time, a hinged cooking grate is a useful tool. The flip-up sides of the grate allow charcoal to be replenished without having to remove the food and the grate from the grilling unit. A drip pan is used as means to collect grease and melting fat that may drip from the food during grilling. The use of a drip pan guards against flare-ups that may otherwise occur when grease drips on the heat source. A disposable aluminum pan, which is available in a number of shapes and sizes, is a convenient type of pan to use for this purpose. 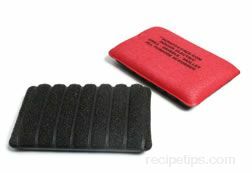 A grate lifter is a handy tool that allows the grate to be removed from the grilling unit for such tasks as replenishing charcoal during the grilling process. The tool prevents close contact with the hot grate, which could cause burns if handled with other methods. An iron sear-top and grill press tool serves a dual purpose. The tool is preheated on the grill and when sufficiently hot, it is placed on top of meat to sear the surface of the meat (while the meat is seared on the opposite side by the heat of the grill). This allows two sides of a meat cut to be seared at one time. 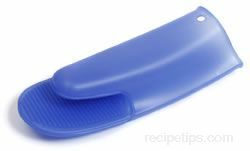 The other purpose of the tool is to prevent meat from curling on the edges as it grills. Thin cuts, such as steaks, tend to curl when grilled, but placing the iron sear-top/grill press on top of the meat helps to prevent this from occurring, while at the same time, speeding the cooking process. 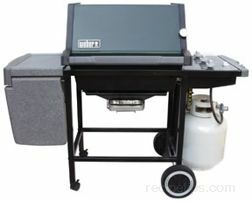 Charcoal wells are included with some grill units or can be purchased as an option. The metal wells most often come in a half-moon shape, allowing them to be placed on the outer portions of a round kettle grill. Usually, two wells, placed opposite each other, are used at one time. This configuration creates perfect conditions for indirect heat grilling because the hot coals are contained within the wells along the perimeter and the food is placed in the center of the grill where no charcoal is positioned. A rotisserie is used for rotating food above the surface of the grill in order to cook the food slowly and evenly. Most rotisserie devices include a spit assembly (the device that holds the food above the heat source) and a means to turn the spit above the heat source, which in most cases is an electric motor. Many grills include rotisserie units as a standard feature or offer it as an option. Rotisserie units are available for gas grills and charcoal grills. A number of tools are effective for cleaning grills after the cooking is completed. Grill grate scrapers are designed with notches that fit over the rungs of the grate. When the scraper is pushed and pulled along the grate, the burnt on food deposits left from the high heat of grilling can be scraped from every rung of the grate. There are also several types of wire brushes that are designed specifically for cleaning grill grates. Both the grill scrapers and the grill brushes are most effective if they are used soon after the grill has been used; however, it is important to make sure the grill has cooled sufficiently so that it is safe to handle. Cleaning the grate becomes more difficult if it has been allowed to sit for an extended period. Heavy-duty scrubber sponges and pads are also effective grill cleaners, but they tend to wear out faster than a stiff metal brush or scraper tool.